Home Books Hitopadesha: Classic advice to benefit from. Hitopadesha: Classic advice to benefit from. Historian Daud Ali defines Hitopadesha as a kind of advice literature. Hitopadesha is regarded similar in essence to Panchatantra and Jataka tales. Though we know little about its origin, historians believe that it was composed by Narayana Pandit thousand years ago. This collection of fables was written in Sanskrit later translated into numerous languages under the Mughal regime. The stories in this are conceived as to educating the sons of King of Sudarshana of Pataliputhra. The entire text, divided into four segments follow an intricate weaving of both prose and verse. In a competitive world where we are consumed with self-doubt, Hitopadesha stands tall and relevant in this age as well. Book one teaches how to make one’s way in the world and how to deal with people. Titled, the parting of friends, the second part tells us how great friendships can be destroyed by men with the aid of cunning schemes. The subsequent titles on war and peace focus on the reasons for war and the need for peace. 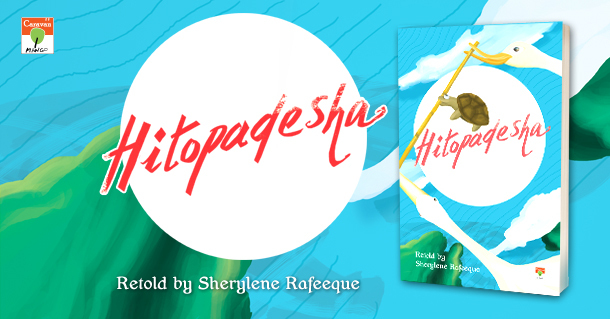 With an aim to introduce ancient Indian text to young readers, Hitopadesha, retold by Sherlyne Rafeeque would encourage every reader to explore Indian literature.